Just picked the first asparagus of the year! Enough for one person, and luckily only I like to eat asparagus around here. I love it simmered until tender then placed on buttered toast and salted a bit. Delicious. Asparagus is also yummy eaten raw, it tastes very much like raw peas, another favorite. The best way to keep asparagus fresh is to store it in water in the refrigerator. Stand the fresh-picked shoots in a glass of water. For stalks purchased in the market that have been held a while, cut off about 1/2″ of the end of the shoot before placing it in water, much as is done with fresh flowers for arrangements. This will perk up limp asparagus. Most everyone knows what eating asparagus does to the smell of urine. The odd odor arises from asparagusic acid in the vegetable that is converted to sulfur-containing compounds in our bodies. The compounds have the characteristic scent. The lucky people, somewhere between 20% to 40% of the population, can not detect the odor or do not produce as much of the sulfurous compounds, and are spared the smell. I don’t mind a little pungent urine for the privilege of eating asparagus. We have a decent sized asparagus bed, about eight feet long and two feet wide. The plant is a perennial and has male and female members of the species. Pollinated asparagus produces bright red, round berries in the autumn. Birds eat the berries. Over the years they have spread asparagus to several other locations on the farm. 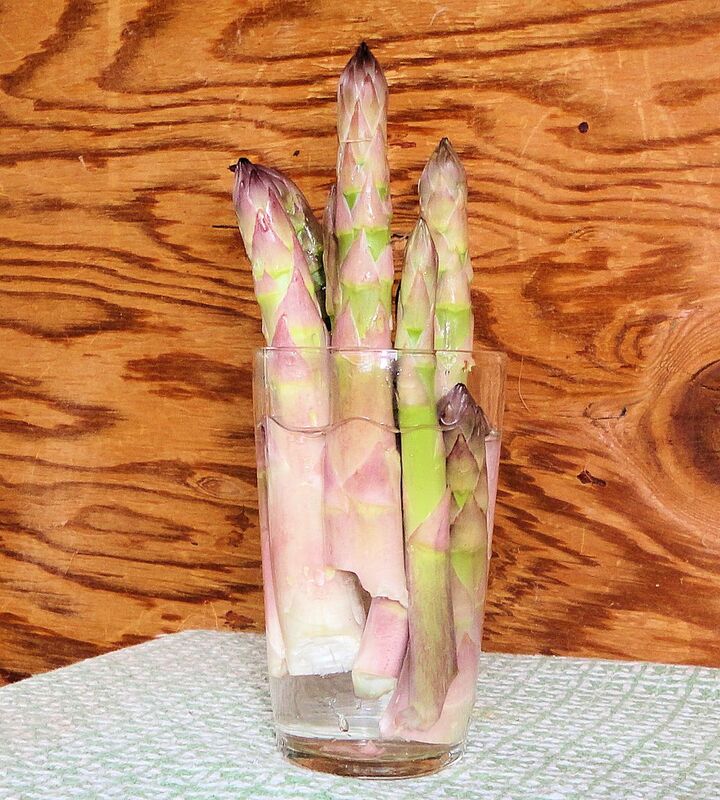 Some people grow only the male plants which tend to produce larger, thicker shoots, and avoid spreading asparagus. I like to hunt for the maverick shoots in the orchards, just adds to my eating enjoyment. Every year I cover my asparagus bed with a layer of well composted horse manure and sprinkle on some wood ash to keep the soil sweet. It is a good idea to maintain a well-weeded asparagus bed, mulched with enough compost to discourage weeds. The asparagus beetle is the major pest around here. It is a bright orange and black beetle that lays eggs on the plant and eats the foliage. I hand pick the insects when I find them. The larvae can be knocked to the ground by brushing the ferns and will tend to die on the ground before they can crawl back up the plant. The beetles overwinter in garden debris so always cut and remove the ferny stalks of the asparagus in the fall. I only harvest asparagus for a short while in late May and early June. The plants must be allowed to send up shoots that grow to maturity so energy can be stored to maintain the roots. Knowing when to stop harvesting can be difficult. The plants should have at least two full months to grow. I get my fill of asparagus after five or six servings, giving the plants plenty of time to mature. This entry was posted on May 21, 2014, in Farming, Gardening, Handy Tips, Uncategorized and tagged asparagus, cooking asparagus, farm life, garden vegetables, growing asparagus, perennial vegetables, storing fresh asparagus.